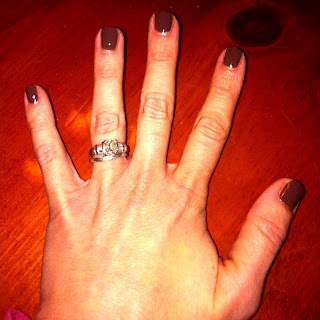 Because Shanna Said So...: DIY - Shellac Gel Nails - Does It Work? A good friend of mine showed me a picture on Pinterest demonstrating a DIY version of Shellac nail polish. I thought, this would be great for my next blog, but does it really work? So, I decided to give it a whirl. The first step was finding the 5 Minute Gel Polish by Nutra Nails. It's a Sally Hansen brand. I was out looking for a little bottle and couldn't find it anywhere. 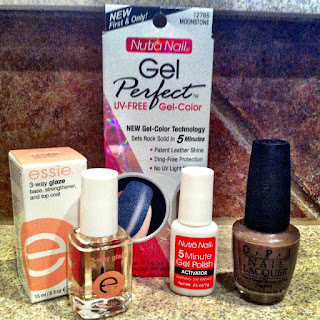 Come to find out, the bottle comes in a gel nail kit called Nutra Nails Gel Perfect (see photo). I found the kit at Ulta and Walgreens. I will say that this must be a hot commodity because there was only one left at each of the stores I went to. Then I bought the Essie 3-Way Glaze at Ulta. I am pretty positive that you can get this at any retailer that sells Essie. This one was much easier to find. Next, I chose a nail polish...I picked one of my most favorite colors, OPI "You Don't Know Jacques". 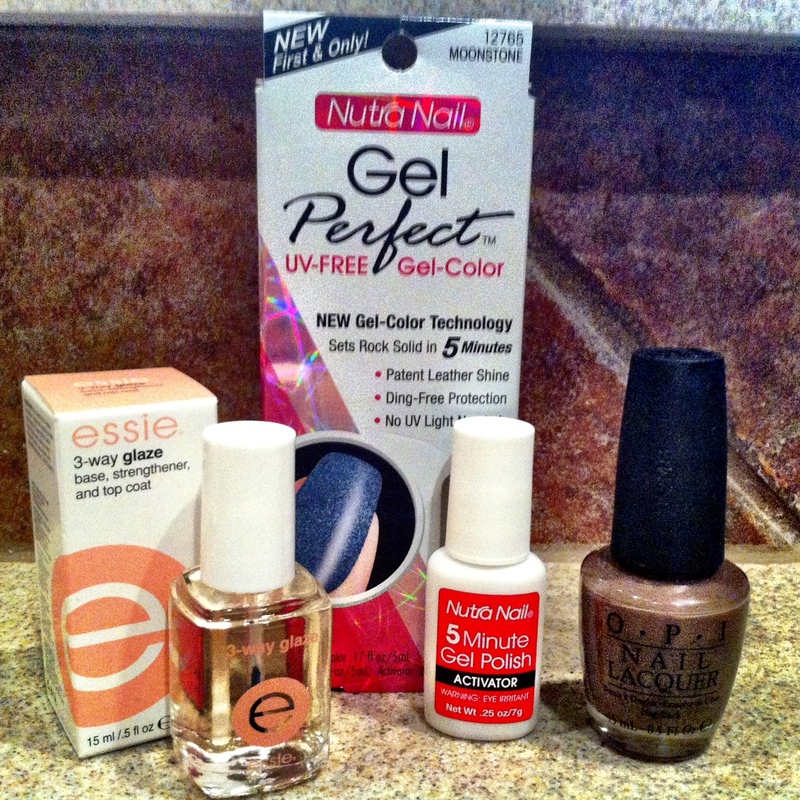 Here is what you will need: FYI - I forgot to put the OPI Rapid Nail Dry (Step #4) in the photo, sorry! Step #1: Make sure you nails are dry, smoothed and buffed. 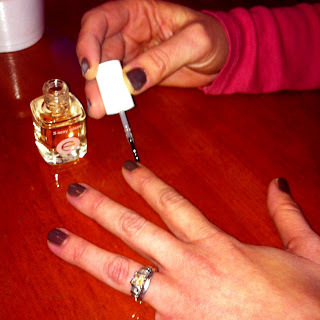 Apply a thin coat of the 5 Minute Nutra Nail Gel Polish. The key is a THIN coat and don't forget to brush around the tips of you nails where polish typically starts chipping first. Let this dry for a couple of minutes. They key to this whole nail project is being patient; which is one thing I am typically not! Step #2: This is very important. The Pinterest directions say to now apply a coat of the Essie 3 Way Glaze. Don't do it! This will make your nails way too "goopy" and will give you bumps in your polish. 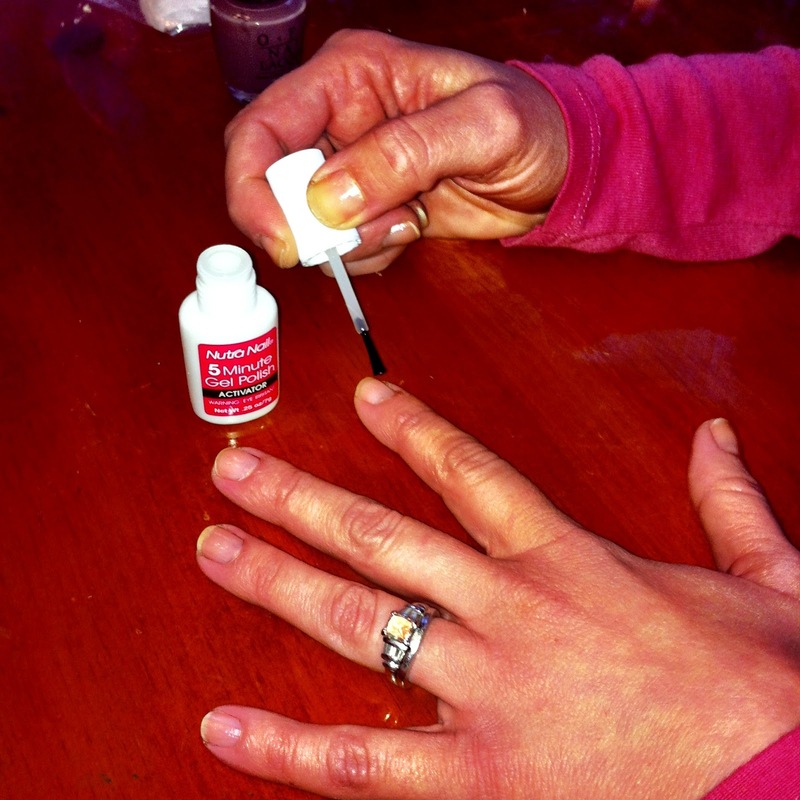 Go ahead and apply your choice of nail polish after the 5 minute gel nail polish. The first coat will appear streaky and uneven...don't fret. You will get better coverage on the second coat. Don't go too thick!! Here comes the patient part again...let you nail polish dry for a few minutes before moving onto Step #3. 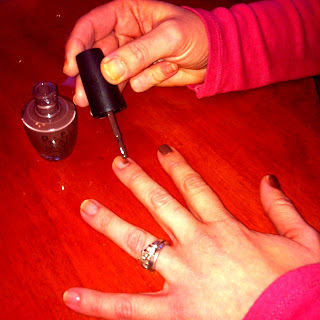 Step #3: Apply a coat of the Essie 3 Way Glaze. IMPORTANT: This stuff is super-duper thick. You have to be very careful not to put too much onto your nail. You can almost do an entire hand with one dip into the glaze. Step #4: This step was left out of the Pinterest directions, but I highly recommend it. Spray on OPI Rapid Nail Dry. There are several nail drying sprays on the market, but this one is by far the best one that I have found. I talked about this product in a previous post. It really does help nail polish dry quicker which "lends a hand" (pun intended) to my "no patience" issue. *Note #1 - Make sure you have a time to let this nail polish sit. Even with the OPI Rapid Nail Dry, it takes a good 20 minutes or so to fully dry. **Note #2 - Even though I used a dark color, OPI You Don't Know Jacques, in the demonstration, I would recommend using a light color, maybe one with a glitter in it. May I suggest Sephora by OPI, "Already Famous"? This will help to hide any imperfections that might come along when trying this for the first time. ***Note #3 - This polish will come off with regular nail polish remover. Anxious to hear the results! Your nails look so pretty and professionally done! I love the gel nails but I just HATE having to soak to get it off. Do you like to follow each other ? I would love to know also! looks fine however, when opening in Internet Explorer, it's got some overlapping issues. I simply wanted to provide you with a quick heads up! Apart from that, wonderful website! I was suggested this website by means of my cousin. I'm not positive whether or not this publish is written by him as no one else realize such detailed approximately my trouble. You're incredible! I loved as much as you'll receive carried out right here. The sketch is tasteful, your authored material stylish. nonetheless, you command get bought an impatience over that you wish be delivering the following. unwell unquestionably come further formerly again since exactly the same nearly very often inside case you shield this increase. I visited multiple web sites but the audio quality for audio songs existing at this site is in fact excellent. how to genuinely get valuable data regarding my study and knowledge. Every weekend i used to go to see this web site, for the reason that i wish for enjoyment, since this this website conations truly fastidious funny data too. additional stuff, is there any other web site which provides such information in quality? It's nearly impossible to find well-informed people on this topic, but you sound like you know what you're talking about! you make blogging look easy. The entire look of your web site is wonderful, as neatly as the content material!